You’ve ﻿scanned﻿ some family photos. Great! But who is in them? With file names like IMG_1092.jpg, it isn’t readily apparent who is in the photo. How can you label scanned photos? You can embed the data into the metadata of the file, but there are two problems with that: time and access. It takes time to type all that up. And what happens when you email that photo to a cousin? Will they figure out how to read that metadata? 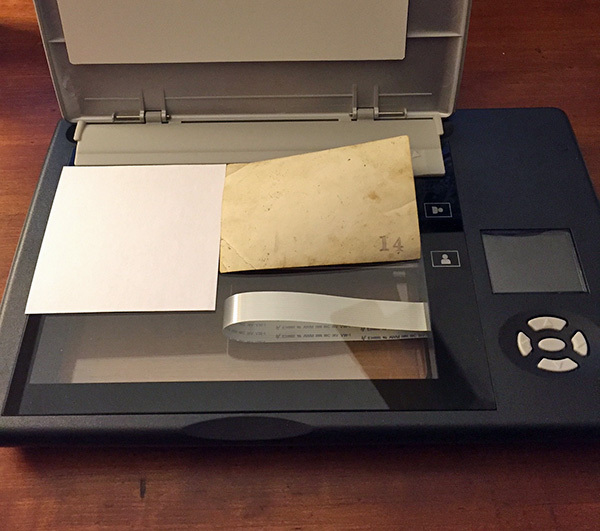 Fortunately, there's an easy, low-tech way of labeling those photos ﻿while﻿ you're scanning. 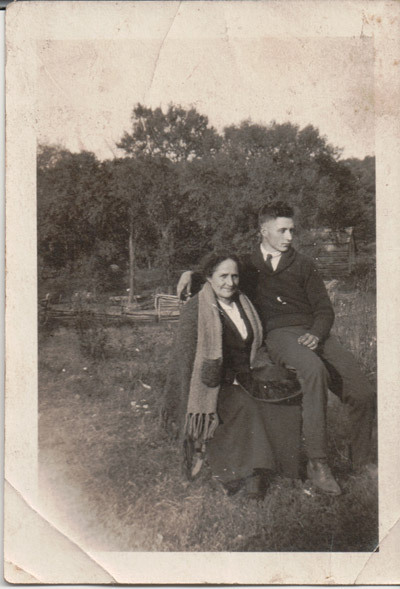 This is a photo of my grandpa with his mom. When I scanned it, I ended up with a file name SCAN0115.jpg. I can enter the data within the metadata using a program like Photoshop, but that takes time ﻿and﻿ my cousin probably won’t be able to find it. Next, I write my ﻿“﻿label” and lay it down on the scanner with the photo. Scan both at the same﻿ ﻿time. 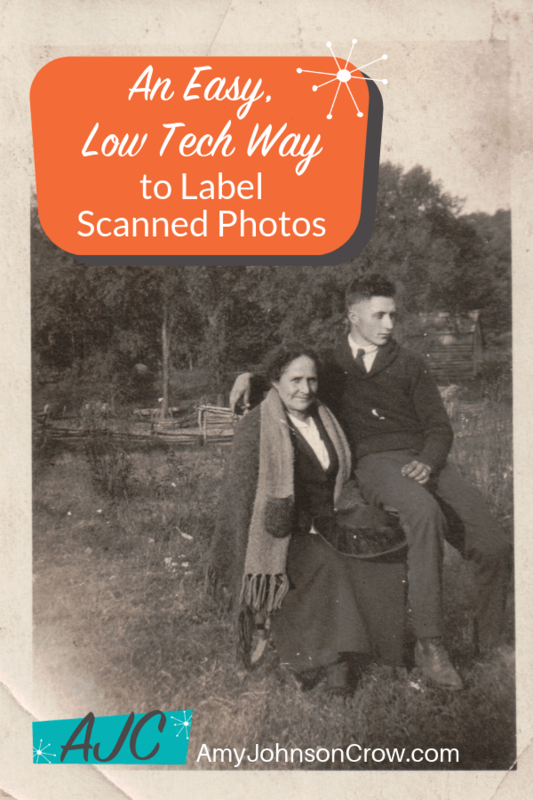 Lay the photo and your label on the scanner, close the lid, and scan at the same time. This makes one image. (I did crop the one below so it would fit on the blog better.) I have the photo ﻿and﻿ the label together. Scanned photo with the label, all in one image. If I knew the date and place, I would add that, too. NOTE: This isn’t to say that you shouldn’t use your photo software to tag your photos. You still want to do that. But this step of writing out the label and having it as part of the visible image makes things easier down the road. If you're wondering, "Why not have all of that information in the name of the file?"... glad you asked. Not all scanners give you the option of changing the file name when you scan. Also, if you're using your phone or other camera as a scanner, you can't change the file name when you take the picture. You might be thinking, “That doesn’t save a lot of time.” Actually, it saves time and frustration. I can﻿ ﻿send the image to my relatives and they can see in an instant who it is. Having the label visible also makes it easier for me to rename the file and to arrange into albums/folders on my computer. Having that information in front of me – literally – means I don’t have to go searching for that data, which saves me time and effort. Yes, it takes time. So does any method of labeling. Sorry. You need to have handwriting that is at least half-way legible. You relative could crop off the label. But that’s their decision. Besides, you still have your copy of it. It seems weird to call our ancestors by their full name. (What do you mean Grandma’s name isn’t “Grandma”?!) But that’s what you need to do when you label your photos. If I had labeled this one “Grandpa with his mom” and I give it to my daughter, she could wonder, “Whose grandpa? My grandpa or mom’s grandpa? And which side of the family?” When you list people by name, it takes out that ambiguity. Add the location and a date if you know it. 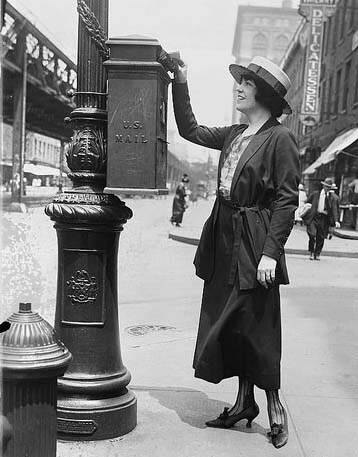 I don’t know either the date or the location in this photo. I hope you’ll give this suggestion a try. When you do, let me know how it goes! 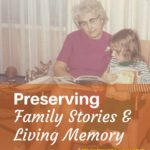 Also, for tips on how to preserve those old family photos, check out ﻿this﻿ interview I did with Denise Levenick, the ​Family Curator. 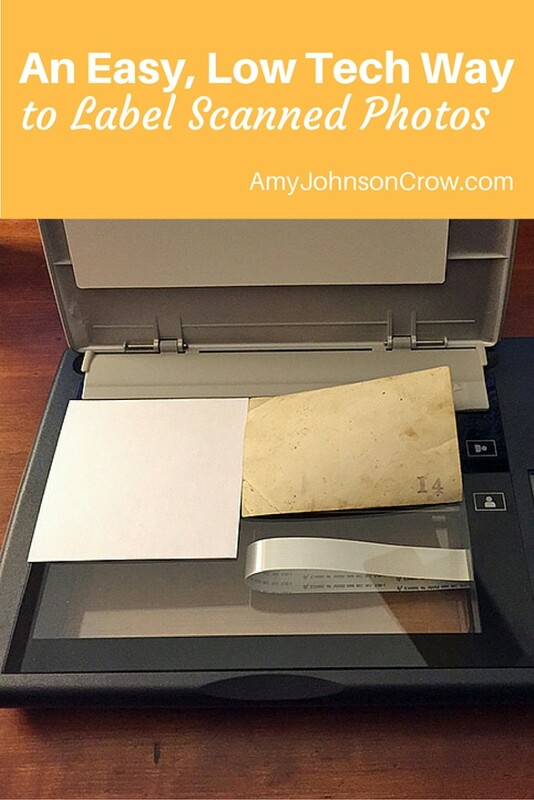 This entry was posted in Digital Preservation, technology by Amy Johnson Crow. Bookmark the permalink. This is a great idea that fits the tech level of many. Adding a date and location for the photo would also be important if they are known. The important idea here is that the names are recorded. I am spending hours researching a photo of “Grandpa Edmund Young and Grandma” to determine which Edmund Young is in the photograph. Yes, I’m just finding some pictures that may have been my grandfather’s but the labels on them don’t always fit who I think they may be. I think my uncle labeled some of them. It would help if I knew what an individual’s handwriting looks like. Regular names (with a birth year or other way to distinguish them from Senior or other like-named person) are much more helpful! If you know the birth and death dates of people in picture add it . then they know the picture was taken some time in between those dates. I am working on a project for the 100th anniversary of my union – this involved reviewing over 400 photos – I bought stickers of letters and numbers – the photos were in individual envelopes – I attached a sticker letter to each envelope A to R – then attached number stickers on the back of the photos I wanted to use in each envelope 1 to 85 – I went through all photos and identified people in picture – date and description – I then gave all photos and information sheet to the researcher of this project. Remember that we can (and should) change the file name on our computer. Putting at least one person’s name into the file name will help us to find it more quickly next year. Exactly. We need to still rename the files and do the tagging in our photo software. But when you have dozens of photos to scan, it isn’t practical to tag or change the file names right then. (And if you’re using a portable scanner like a FlipPal or using your smartphone, you can’t change the file name until you transfer the files to your computer.) This is an aid to help you later so your organizing will be faster and easier. However, using a FlipPal you can lay a sheet of plexiglass over the photo. Then use a water erasable pen (NOT dry-erase) and write names on the people, add dates, places, who has the photo, etc. and scan it. Remove the plexiglass and scan again. Voila, instant info for the photo. I bought several of those plexiglass sheets at the dollar store (they were magnetic 5×7 photo holders). Two people can go through a stack of photos very quickly. One writes, the other scans and cleans the plexiglass and passes it back to the writer. We do this at family reunions or at a relative’s home, etc. You can rename the files, add metadata, whatever you want later. The info is there waiting for you. Thanks for explaining your method. I am using !y flip pal for the second time and this will really help! Awesome! I, too, have been using the FlipPal and this method has helped quite a bit. Have fun scanning! I have a photo album that was passed down to me. Luckily most of the photos are labeled but by someone who wrote, Grandpa Gleeson. What I had to do was figure out the relationship from Muriel, who created the album. Then I knew who everyone was! Wouldn’t it help to Put a name and the Date the Photo was Scanned as part of the File Name and then all the other Information as the Label with the Photo (Include the Date Photo was Taken). That way you will have an Idea how Old the Photo is when put into your Computer, with Other Photos scanned and dated afterwards (and each time) they are scanned so they will also have a date and name to go by. I have gotten Frustrated trying to find my photos with the computer generated names. Yes, that will definitely help! This isn’t meant to be the only way that you label or tag your scanned photos. This is meant to streamline your processing later. If you’re using your phone or a portable scanner, you’re not going to be able to work with the file names until you get those files transferred to your computer. This get the info with the image while you’re working with it so you don’t have to go hunting for it later. Thank You for your reply Amy. When I’m doing multiple scanning, when I go to save my first scan I carefully pick the location of where it’s being saved on the computer. After that, all other scans will be saved in that location unless I change it. An example would be to have a “File” in “My Photos” labeled “Need to be Sorted”, then in that file another file labeled with the date that I’m doing the scanning. That’s a great suggestion, Marti! Having that folder helps you see exactly what files still need to be worked on! Thanks for sharing. Many photos aren’t labeled with a date, but using information from your genealogy software can help immeasurably. I suggest using the approx. age of the youngest person in the photo to make an estimated date. My family will probably not want to look up ages and calculate years, but if I’ve already done that work (& recorded it the way you suggest here – which I love) the photos are much more enjoyable for everyone now & in the future. Even to guess a decade will be of more help than no date at all. Just be sure to use “abt.” with the date if it is estimated. Yes, even a decade can help me on some of my pictures. Adding dates would be helpful! When I’m in a scanning mood, I take the scanned image, add an inch or two of white to the bottom and add the information using my Paint program. This is something I also do. It makes for a neat looking label and doesn’t interfere with the look of the photo. I always like to say where and when I got the original photo… even if it is just “scan rec’d 01/11/2014 from C. Stephens” This lets me know who has the original. For married ladies, do you label them with their first, middle, maiden, married, married, names, etc??? (Example – lady was married twice – Lucy May Turner Smith Jones). Would you label only up to her maiden name on photos taken before she was ever married? Would you label only up to her first married name in the photos taken during the first marriage? Would you do her complete name on a label for EVERY photo that she is in? Thank you for your help. I want to do it correctly the first time. So all photos of Matilda (Debolt) Skinner Crossen Brown McFillen would have Matilda (Debolt) Skinner Crossen Brown McFillen on them, even if she were 5 years old in the picture or even if she was in the picture with her first husband. Correct? Yes, that’s how I would do it. Having the full name helps distinguish her from other Matilda Debolts, Matilda Skinners, etc. Another thing I do whenever I’m scanning old photos is to share them with all the siblings on facebook (I set it up so it will only show to people that I pick)**. This has helped immensely when it comes to identifying who, what and when of a photo. It also is a great way to share and engage other family members; especially with us scattered across the whole country. ** I’ve actually started a “Private Secret Group” on facebook where I share all this type of stuff now. Much easier! I like to share on Google at original resolution. I’m not sure if sharing on Facebook does this – I think the file is compressed. If someone wants to make a print, their results may not be as good as your original. Great point about saving multiple versions of the file! Always a good idea to save the original and edit from a copy of the file — that way, if you mess up, you haven’t destroyed the original file. We did this several years ago and it has been a great help. We typed the names. It has been easy to crop the names and insert the photos in the family history book I am writing. I am adding captions in the font I am using in book. I also appreciate your suggestions about photographing gravestones, and including several images. In the 1980’s I visited the graves of several ancestors with a cousin. I got a few clear photos, but it was nearly impossible to read most of the engravings in the prints of the photos. I had no record of the name of one of the cemeteries. I remembered the name of the street on which the cemetery is located, but even that was of minimal help in figuring out the cemetery name. It took me a very long time to figure out the name of the cemetery. A Find A Grave volunteer graciously took close ups and distance pictures and the photos are readable and clear. Best to take a photo of the signpost as you go in to each site (or a photo of a hand written sign if there is nothing else). I have found that the best way to do it is to take a picture of the picture. That way I can copy and hand the disk to others. If I need to restore the photo I have more data to work with. Also, many times the students at BYU-I who scan their pictures end up getting less than desirable results. (lots of noise, scratches and smudges from a dirty scanner bed.) When you download the pictures it is easy to rename them with the info that you need. Taking a photo of a photo is handy — I’ve done it countless times! — but it isn’t without its drawbacks. It’s easy to not have the photo and camera lined up and you end up with an image that’s skewed. There’s also the issue of color correction, reflections, etc. But if you do take a photo of the photo, you can still do this labeling method so that you’ve captured the information; then you can rename the files and add metadata at your leisure. Great idea. 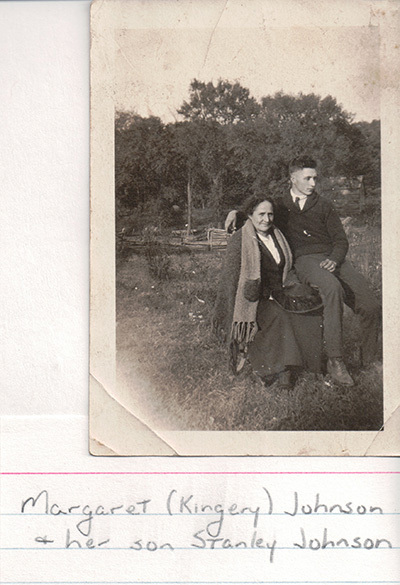 My only suggestion (after scanning and sleuthing lots of very old family photos) is to add a circa date to your label. In other words, take a guess on the date of the original photo. Clues can be in the form of what the person looks like as opposed to their date of birth, objects included in the photo (like a car, for example) or the type of photo (tintype, cabinet card, polaroid, etc. )That gives future generations a chance to further figure out someone’s identity. Without at least an educated guess for a date, the person could be Billybob Senior or Billybob Junior. 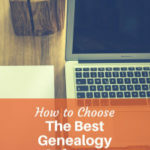 In my family tree, some branches have several cousins with the same name, so dates really help. Yes, a date — even an estimated one — is a great bit of info to have on your label! I have a similar situation of several cousins or even father/son mother/daughter with same names so I include John James (-m-Sarah Robinson) -m- for me mean married/marriage and John James (-m- June O’Neil) or John James son of Fred & Mary. That’s smart to put some kind of description that allows you to tell which John James! great idea Wish I knew this sooner. Do you have any ideas how to do this with pictures already scanned? There are some programs that will let you add metadata like description, location, and dates, in batches. (You can also do it one at a time, but that’s a lot slower.) The process varies with the program that you’re using. You can also alter the image and add space at the bottom and type in the information so it’s visible, like the handwritten label would be. Again, the process varies with the program that you’d be using. Amy what program will let you do that? Photoshop. I think Photoshop Elements. If you’re on a Mac, Photos will let you tag multiple photos at once. I just put the concise information in the digital label itself – who, where, when and what, etc. (if their is enough room). As was said, other Meta Data can be added later. The number of photo should come first in the digital label, ie. 00203, leaving zeros in front so that their is room for future numbering and so they can be properly indexed. The numbering system can be put on label paper purchased at a stationary store, ie. Staples or online. Using Microsoft Excel one can do the numbering with an easy numbering system on your computer and then printed on full sheet label paper. These label numbers can then be cut with a pair of scissors and placed on the back of the prints. Note: Scanning and labeling negatives can be a little more challenging (they should be put in protective negative holders). Folders for these digital photos (Prints) should be put into computer folders to begin with when they are scanned into your computer. They can be sorted later into different folders with accompanying reference numbers on the labels of the Folders with other concise information. I have done well over a 1000 Prints this way and it has worked easily and quickly. There is even room to put several prints on the scanning bed at a time. Why use digital information on the label itself? Digital information is better because you can use your computers search engine to find precise digital photos easily on you computer at a later time. Those are all excellent points. The reason I suggest doing an analog label to be scanned with the photo is so that the information is readily available when you have time to go back through and handle the metadata and rename the files. When I’m at my parents’ house scanning dozens of photos at a time on a portable scanner, I can easily lose track of who is whom by the time I get home and transfer the files to my computer. (Same for if I were using my phone or digital camera.) It’s a supplement, not necessarily a replacement. That’s awesome! I bet that was a thrill to find him in a photo like that! Send the photo to as many people who think might know who is in them and ask them for any knowledge they may have regarding them. Older people that are still alive may have knowledge that can put things together for you – Put pieces of the puzzle together and you will blessed to know who they are. Then put essential information – the who, where, date (approximate date) – dates and times can be researched if you can see some information as photos are enlarged and made clear through advanced scanning processes. SileverFast 8 has a wonderful, new removal of dust and scratches called SRDx that leaves most of the picture in tact, with remarkable clearity and in combination with other programs like Corel Draw Photo Paint (not promoting products) where great clarity can be restored. Negatives (if found) to photos sometimes can be found and scanned in to revel even more information. Keep up the great work – the doors will as we do the research. This was a great idea, Amy! There are so many wonderful suggestions in the comments section that I am saving the entire post! Thank You! Glad you found the post and all of the comments useful, Barbara! One thing I would add, when identifying a group, if possible, try to lable the pictures front row, left to right; back row, left to right; center, left to right. I have a number of group pictures where the names are just listed in a long list and nobody matches where the list says they are. Great suggestion! It’s definitely a “good news/bad news” situation to have all of the names, but they don’t match the people. Something I’ve seen done with group photos is to make an outline of the people, number each head, then have a numbered list of the names. Works especially well when people aren’t lined up in rows. I have done it this way for many years too now Amy. Especially for big family or class photo type pics as they get a bit mixed up when trying to say what row when they aren’t really in rows. I usually send out a group photo with my Christmas cards and letter each year to keep people up to date with our family goings on. There have been a few years where there were too many people to just write on the back of the photo so I did it this way then too. I even included in some years the relationship to people when the children had new partners and children etc. I use Photoshop Elements to add a white label at the bottom of the photo and list the people present by row or left to right, as appropriate. Since you can easily adjust the size of the font, it makes getting all the names on quite easy. This is a good idea. BTW it you do not have Photoshop, but have Powerpoint, you can create a slide with the picture and label, then SAVE IT AS a JEPG file. I have found that save option to be very useful. Seriously? Do you not know how to click to highlight and type? All my scanned photos have been named with that information and I didn’t have to kill trees to do it. I appreciate where you’re coming from. When you’re using a stand alone scanner (like a FlipPal) or using a camera or smartphone, you can’t change the file name after each scan. And if you have 500+ photos to digitize like I did, you look for ways to capture the information as you go. My cousin is amazing (something to do with TWO PHD’s and a Masters from Oxford lol) and he puts detail information and stories with his FaceBook posting. I am copying the info for each picture into WORD, one after the other. When scanning, just position the current photo to expose the right description! You don’t type anything! You just cut-and-paste! We all need a cousin who’s willing to type up the descriptions like that! I set up a MSWord table (1 col x 2 row) and paste the image into the top row and identifying info into the second, Then I can print the whole thing onto photo or plain paper. Thanks for posting your technique. Obviously, if the who, where, etc. of the photo isn’t known, there is little value to later generations. Unfortunately I have inherited some like that, and it is a heart-breaker to never know who these folks were. But, a note of caution regarding your scanning technique! While I am still in the steep upwards part of my learning curve for scanning family photos, I’m led to believe that the colors and tones of a photo can be adversely skewed by including colors that are not in the photo, even such small areas as a margin on the print! I can only imagine that by adding a sheet of paper to the scan would have an even greater effect. A good source explaining this factor is the online source “How to Digitally Archive and Share Historical Photographs, Documents, and Audio Recordings” by James E. Kennedy. See section 2.9 “What to Include and How Many Master Images to Make”. This source would make for a good read for those that are willing to spend the time to try to get the best results from their efforts. Mr. Kennedy states that if the margin contains historically significant information, such as a time stamp or written information about the subjects, then one might want to make two scans for archival purposes – one including the margin, and one that will be more true to the photo’s color by excluding the margin that will lead to better reproductions. This is easily done in the Epson Scan software that I am using. I assume that feature would be included in many others. I know this process can significantly increase the number of files one has, as well as a more than doubling of time involved. But, as with many situations, the originals may eventually be lost or destroyed, or they simply not available again. So, the advice is – make the best scans you can for both historical as well as quality of reproductions. Good point. The quality of the scan is dependent upon a number of factors, including the quality of the scanner and its color algorithms. The display of the resulting image is also dependent upon the monitor it’s being viewed upon or the printer that was used to print it. I could not locate that title in WorldCat. Where was it published? It is a web page. Look in Google to find. Amy..another great idea, thank you! Recently, I have started saving two images of some things. One with a label I created in my software and one without. I have not done that with every image, but I wanted a few of them with labels and without. Either way, labeling is a good thing! Regarding scanning, I came across an app called Photomyne. It enables the user to scan an entire page of pictures in a photo album and produce individual photos. I scanned over 400 photos in less than two hours. It costs $4.99 for an iPhone app. Don’t know Android availability. Wow, what a wonderful list of ideas. I have only 7 generations of photos to go through for the 2 of us. This may remove the fear of tackling those boxes. Thank you!!! What scanner are you using in these photos? I’m using a Flip-Pal scanner. Great article, now I need to go find out about a FlipPal. If you’re looking for portability and ease of use, it’s hard to go wrong with a Flip-Pal. I wish it gave the option to save as TIFFs, though. Thank you again for the great tip. I sure do like your low-tech procedure! I’ve always done the labeling in a somewhat similar manner but more time intensive …. after I scanned the photo, in my photo editnig program (Paint Shop Pro) I’d enlarge the “canvas” of the photo on the bottom only. I’d then enter text that would be the same information as what you wrote on the paper. The details of the photo would then be permanently attached to the photo (but any recipient would still have the option of cropping it off … or just framing the photo to exclude the text). However, all that takes takes extra time, whereas if I were to simply use your procedure, I’d still have the info but eliminate the extra Paint Shop Pro step. That is definitely very attractive. My naming convention always starts with “year-month event/people” so that when the directory containing my photos is sorted, they automatically are in chronological order. This is a great idea. I’ve been looking for some kind of sticky note program that would allow me to attach information like on a sticky note, only digital. I’ve been compromising by putting what I can in the photo title, but it just all won’t fit. I used sticky notes….they did not slide or adjust with air movement when I closed the copier. Also, I copied the reverse of the photo if there was anything there….sometimes the photographer or other info might give a clue to who / what / where / when of the photo. when I scan a photo I scan it like it is an 8.5 x 11. I them use the crop to crop down to the photo size. I leave about 1.5 inches below the bottom that I don’t crop. I them use one of my photo programs to type text into the white box at the bottom. This way I can put names dates ect. No one will have to figure out my hand writing. My only problem is with photo’s I get off the internet from family. I have to print them out, Then I have to scan them and create my text box. I wish there was a program that would simply add a text box to the bottom of my photos. I actually use real sticky notes for labels when I scan. I can ID the photos while watching TV or such, or ask Dad or brother who is this, then go into scanning mode. Easier to sort and I attempt to group them in either chron order or by person with names, dates, places. Eventually, I rename the computer files. Just don’t stick the sticky note to the photo. The adhesive can leave a residue, which could be harmful. Thank you and everyone else for all the great ideas. I started scanning old photos a year ago. Now I want to go back and add better descriptions using some of these ideas. This tip made my day! Great idea! Wish I’d thought about that before scanning several thousand old photos! Many had info written on the back, which I scanned immediately after the photo, but my computer has a bad habit of sometimes mixing up the order of photos, so I have a lot of unidentified photos and a lot of captions that I don’t know which photo to put them with! This would have helped so much and prevented me from going through a huge stack of photos trying to match them with the backs so I can put names with he correct photo! This is all helpful information. But remember, in the long run, only paper photos are accessible for 100 years or more! Technology will continue to change. Remember all those coloured slides hanging around in basements and attics? Few of us have projectors to view them with. Yes you can digitize them, but what guarantee do you have that those discs will remain able to view. Get paper pictures done of your most special photos, on archival paper, store them in acid free boxes away from heat , light and humidity. Playing devil’s advocate — what “guarantee” do we have of anything remaining available to view? We’ve all seen paper photos that have been torn up, written on, or so faded that the image is unrecognizable. The best we can do is take care of what we have and make sure that it’s still in good shape when we hand it off to someone else. Get it in as many formats as possible in as many locations as possible. Not so much reply as a question please, I have two albums going back to 1900 begin all photos are glued in, how do I scan those pages? Great question! You could get a small scanner, like a Flip-Pal, and turn the scanner over top of the album. (Rather than turning the album and setting it on top of the scanner.) You could also set up a camera stand and use a camera or your phone and photograph the pictures. I love this idea and I’m going to start doing it. Too bad I have so many already scanned, but I’ll work on correcting those by adding a label with Photoshop. This would be SO VALUABLE FOR ANCESTRY.COM. 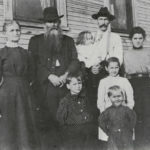 I don’t know HOW MANY times I have found an old picture of an ancestor or distance relative and there is nothing physically on the photo that says who it is. Can I trust that this is who the member who added it to Ancestry says it is?? Have I saved it from a person who mislabeled it?? I’ve downloaded a photo before from Ancestry and used Google’s photo search, only to find that an image was attributed as another person than the Ancestry member had suggested. I vow to start labeling my photos before I post them to my Ancestry account.